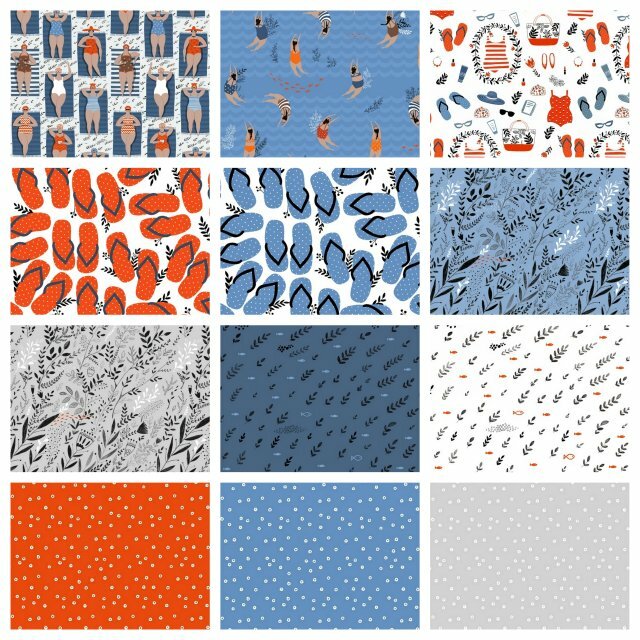 We just received Swimteam by Dinara Mirtalipova for Windham Fabrics. The perfect collection to kick start summer. Windham notes: "This delightful summer group by new Windham designer, Dinara Mirtalipova, features ladies sunbathing on the beach and swimming underwater with fish. Adorable complementary patterns of beach accessories, flips flops, and underwater scenes fill out this unique new collection. Dinara's thoughtful illustrations frequently whisk you away to magical places---Swim Team is no exception with its 50's bathing suits and cat's eye sunglasses. The main colors of blue and gray will cool you off in the hot days of summer. Will you make a skirt, a beach bag or a picnic blanket?"